Little did I know that Joanne stalked my Twitter feed before Christmas seeing if there was anything I was coveting and sure enough, I was wishing my heart away for Charlotte Tilbury's Filmstar Bronze and Glow. And here it is thanks to my lovely generous sister! In the words of Stevie Wonder, "Isn't she lovely, isn't she wonderful?" As it is with the whole range from Charlotte Tilbury, the packaging is beautiful. Art deco, rose gold - pure beauty, luxury and indulgence. I'll never tire of whipping this or anything else I own from Charlotte (yes, I'm on a first name basis with her as we are pretty much besties after spending an hour with her *ahem) out of my makeup bag. Inside you've a grand big mirror so you can see what you're working with. In my case, we're working with no cheekbones whatsoever and I need something to sculpt and highlight like a mofo. The sculpt shade is quite warm, something we've been told to shy away from when it comes to contouring. And wait until you hear that it has really soft shimmer in it too! Wait, shimmer in contour? Yes, big fat yes and it's only recently that I've learned that having shimmer in contour isn't a bad thing. But more on that next week. The highlight shade is very shimmery indeed. A bit too shimmery for me to wear during the day, but wearing it at night is a whole different story. It gives a golden candlelit, lit from within, airbrushed glow to my cheekbones and for that reason, I lash it on when I'm out and about at night. I can't wait to try it with a tan too. I bet I'd be able to pack more on which is always a good thing. So how does one use this I hear you ask? 1 - 2: Using an angled cheek brush, I start at my hairline and sweep down my cheekbone so that most of the product sits at the back of the cheekbone. That's where you want most of the intensity and that's where you should lay your brush down first. 3: I blend back into my hair to make sure I don't have a scaldy white line right at the hairline which will give your secret away - that you don't indeed have mighty fine cheekbones. For me, blending is key and I like to make sure all of my edges are soft. Any powder brush will do the job and I like this angled one from Pink Avenue brushes. 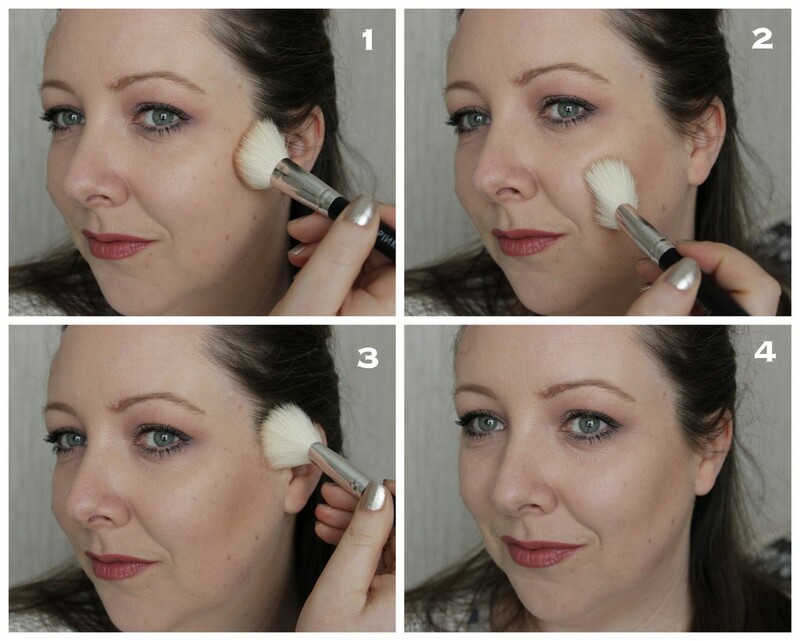 If you're feeling particularly bored and like to wash makeup brushes, then go ahead and apply the contour with one brush and blend with a clean fluffy face brush. That means everything will be seamless and you're halfway there to pretending you have cheekbones from the heavens. 4: This is where I stand back and assess the situation. I look at see if I need to shade another stone off my face or leave it be. Applying and blending in light layers is the way to go or else you'll just look dirty and mightily uncontoured. 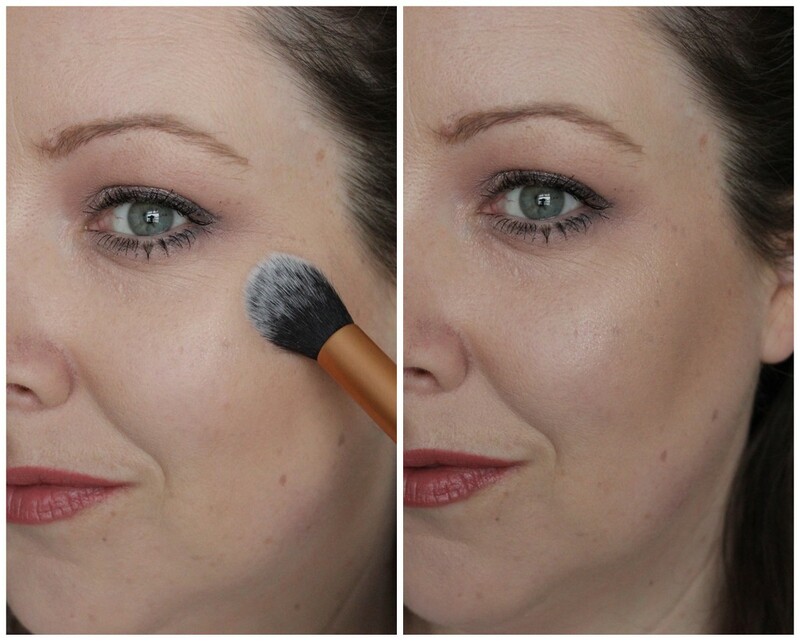 I use a smaller brush to apply the highlight at the top of my cheekbones. I applied really thin layer but you can see how it reflects the light, making my cheeks appear higher. Just call me Jennifer Lawrence why don't you. Used lightly, the Filmstar Bronze and Glow gives a wonderful soft glow to the face, both in the contour department and highlight department. Do you absolutely need it? Well, if you have a spare €65 knocking around the place, then by all means go out and buy it because you will most likely love it like I do. But it is dupable though like so many of the great products out there. In saying that, I know for an absolute fact that if I'd all the dupes for this, I'd still want to go out and buy it because it's Charlotte Tilbury, she makes fantastic products and it's the perfect contour and highlight compact for me when I'm heading out. Charlotte Tilbury's Filmstar Bronze and Glow is available from Brown Thomas and online. So tell me, which film star do I look like other than the very obvious comparison to J Law? It's freakin' gorgeous! But the money!!!! Love it- looks great on you but it's pricey! The packaging is the most gorgeous and elegant ever! The want for this is real! I've been needing this ever since it came to Ireland, just can't actually bring myself to buy it yet.. Also,the photo's are amazing in this.